For the month of November, we thought we would switch gears a little and throw in some holiday gift ideas using your JustRite stamps, so be watching for those, too, on November’s hops! And in celebration of JustRite’s Christmas Blog Hops, they have a huge surprise for you -- take 25% off All JustRite Original Christmas Stamps now through November 29 with free shipping within the U.S. on orders over $50 -- Don't forget to tell Santa! Accessories: Provo Craft Snow Dots embossing folder, May Arts twine, Diamond glass glitter, Satin ribbon, Foam tape, Sewing machine and white thread. Sparky is adorable! Love that redbird! Super cute, Sparky! Beautiful card! This is so lovely and cute!!! Gorgeous ribbon with the sentiment coming out!!! Love the stitching and embossing!!! Beautiful as always, Stephanie! Love your color palette and the big red bow! I swear I wish I could send you a ticket to fly straight to VA and teach me how to use my sewing machine! Your stitching is flawless ♥ Hope you're well, girlie! to cute Stephanie! !Adorable image and wonderful red bow!! Sparky is adorable. Love your card creation. Sweet card, love the colors. So adorable, Stephanie! Love your coloring and that big, gorgeous bow! Cuuute card Stephanie! 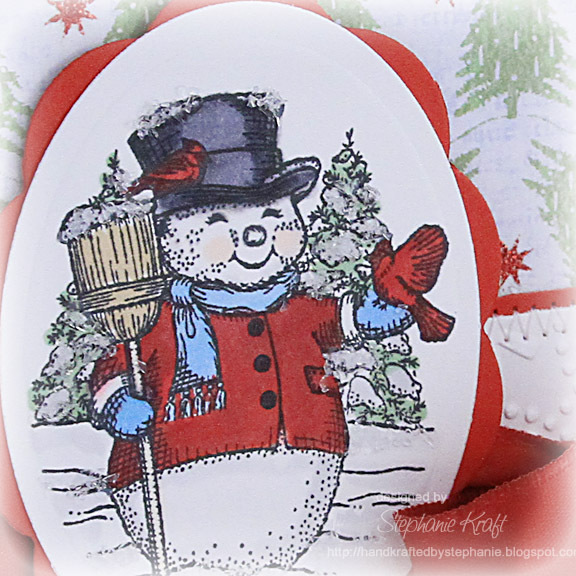 Love the lil snowman and big red bow! We both used the same DP today! :) LOL great minds think alike!!! ahhh! adorable. LOVE this image and your coloring of him! Sparky looks so handsome on that wonderful background paper. Red sparkle snowflakes give him such a festive background. Very sweet!! Oooo!! I love that tree bg Steph! And your bow...*sigh*...gorgeous!! What a sweet, sweet card!! Such a cute card! 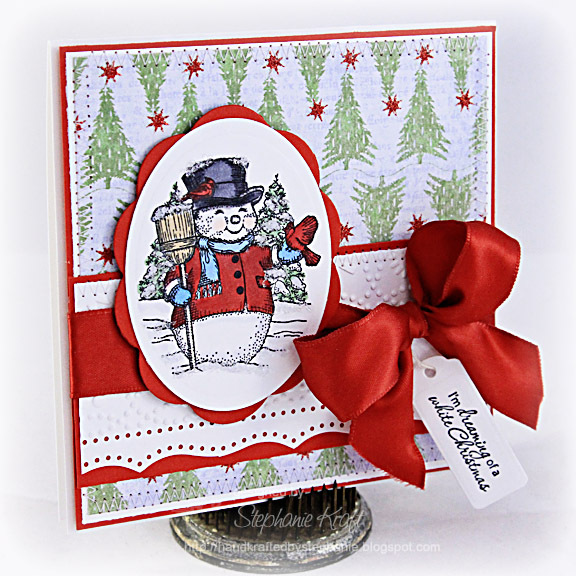 I love to put snowmen on my cards as you can use so many different colors with them. Thanks for sharing!! What a beautiful traditional holiday card. Love your snowman!